Want to reward your smarty pants kiddos for getting good grades? What better way to celebrate those good report card grades with Bareburger and a FREE Sundae! 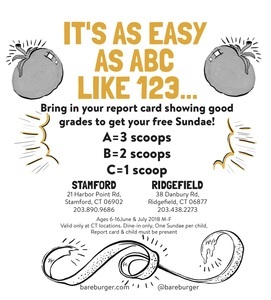 Kids ages 6 to 16 can bring their report card to Bareburger in Ridgefield or Stamford (Monday through Friday) in July for a sweet treat! "A" gets you 3 scoops, "B" gets you 2 and "C" gets you 1!